34 | BROADBAND COMMUNITIES | www.broadbandcommunities.com | NOVEMBER/DECEMBER 2017 ECONOMIC DEVELOPMENT Small businesses need technical assistance to make informed decisions about using e-commerce, social media and websites to find new customers. Building the Broadband Economy An innovative program in eastern Kentucky teaches businesses to capitalize on broadband access. By Masha Zager and Hilda Legg / Broadband Communities A s many communities have learned, broadband – even great broadband – isn't a panacea for economic woes. Rather, it is a precondition for businesses and communities to compete effectively in the modern economy. Spinning that broadband into gold requires considerable training and effort; even with those inputs, the results may be a long time in coming. In eastern Kentucky, the collapse of the coal industry, long a major employer, created severe economic hardship. ough a successor to coal hasn't yet emerged, government agencies and economic development organizations at all levels are aware that the region needs to participate more fully in the digital economy. Efforts are underway to retrain miners and other displaced workers as computer programmers and home- based call center agents. In addition to jump-starting new industries, local leaders aim to grow the region's existing businesses by helping them leverage the internet. e Eastern Kentucky Concentrated Employment Program (EKCEP), which serves 23 Appalachian counties with training, employment and workforce development programs, has pursued this strategy since receiving a grant from the U.S. Economic Development Administration (EDA) in 2015. 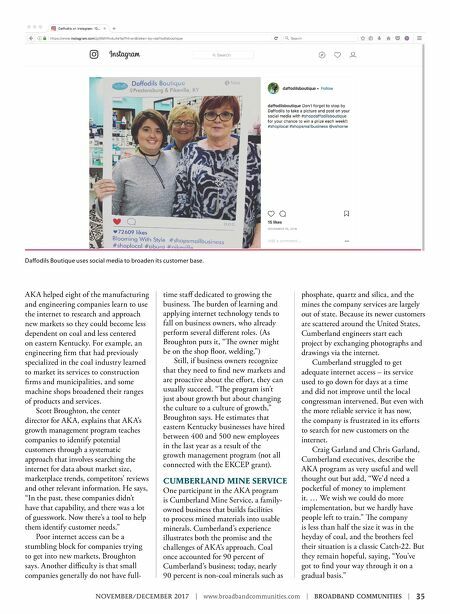 (EKCEP's Teleworks USA program, which trains home-based workers, was featured in the January-February 2016 issue of Broad B and Communities .) LEARNING COMPANIES' TRAINING NEEDS Ian Mooers, the economic and entrepreneur liaison at EKCEP, used the EDA grant to set up an internet and e-commerce training program in six communities in EKCEP's service area. Beginning in spring 2016, he reached out to 54 companies in the retail and manufacturing sectors. With help from Strategic Networks Group (SNG), he surveyed about 15 of them to find out how they currently used the internet and compared that to national benchmarks derived from SNG's earlier studies. Based on the survey respondents' needs and opportunities, EKCEP devised a program that included workshops, one-on-one technical assistance, website analysis, and training in e-commerce and social media, conducted mostly by the Kentucky Small Business Development Center. Mooers says, "We're finding that all these small businesses really need technical assistance to help them make informed business decisions." PATHWAYS TO NEW MARKETS EKCEP also brought in Advantage Kentucky Alliance (AK A), a nonprofit funded through the U.S. Department of Commerce manufacturing extension partnership program, as a consultant.